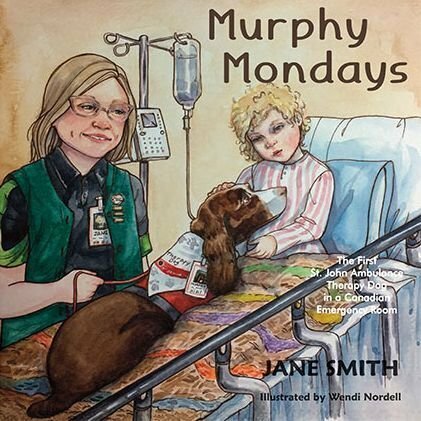 Murphy is the first St. John Ambulance Therapy dog to visit a Canadian Emergency Room (ER). Since 2018, Murphy and his handler/owner, Jane, have visited the ER at the Royal University Hospital in Saskatoon, Saskatchewan one day a week. Those visits are enjoyed so much by hospital patients that Mondays have become known in the emergency room as "Murphy Mondays". Murphy and Jane also spend time visiting special care homes, seniors' residences, schools, and other buildings where people of all ages like to pet Murphy and give him hugs. Murphy loves the attention. He returns their love by wagging his tail or looking at everyone with his big, brown eyes. Murphy often falls asleep when people get him. He loves their gentle touch and is glad the he can make them feel better just because he is with them. Murphy and Jane also love to teach children how to wash their properly. Singing "Happy Birthday to Murphy" is a fun way to learn.